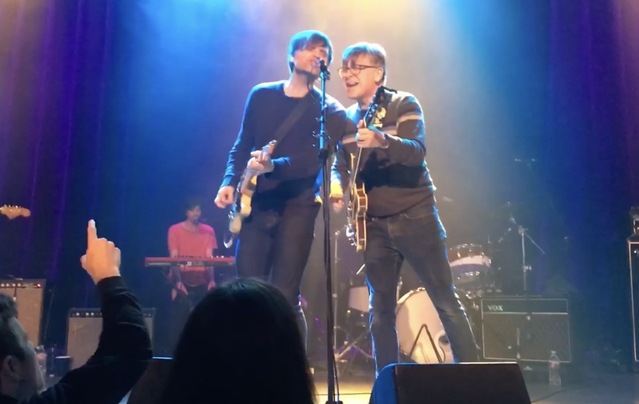 Death Cab for Cutie frontman Ben Gibbard joined Teenage Fanclub at their show Friday night in Seattle to perform their Bandwagonesque song “The Concept,” as Stereogum points out. Gibbard joined frontman Norman Blake at the mic, where the two sung alternating verses, coming together for harmonies in the song’s second half. Both vocalists were all smiles as they strummed along emphatically during an extended guitar solo outro. Death Cab for Cutie’s latest album Thank You For Today was released in August featuring singles “Gold Rush,” “I Dreamt We Spoke Again,” and “Autumn Love.” In December, the band released a remix of the album track “Summer Years” produced by former Postal Service bandmate Jimmy Tamborello. In 2017, Gibbard released a cover of “The Concept” as part of his full-length album cover of Bandwagonesque for Turntable Kitchen’s Sounds Delicious series. Teenage Fanclub’s last album Here was released in 2016. The band recently released a new single titled “Everything Is Falling Apart,” their first since the departure of the band’s co-founder Gerard Love. Their third album Bandwagonesque was Spin’s 1991 Album of the Year, memorably beating out Nirvana’s Nevermind, My Bloody Valentine’s Loveless, and A Tribe Called Quest’s Low End Theory, among others. Watch Gibbard join the band to perform “The Concept” below.